The word of the year has got to be ‘post-truth’, right? I see Oxford Dictionaries agrees, giving it the accolade last month. Post-truth has been everywhere this year – I even got to experience it myself, with projects I’m closely involved with at work being reported on by various news organisations in less than accurate ways. As an aside, seeing that occur in a field I’m familiar with made me wonder how many other news articles we read are inaccurate and misleading. 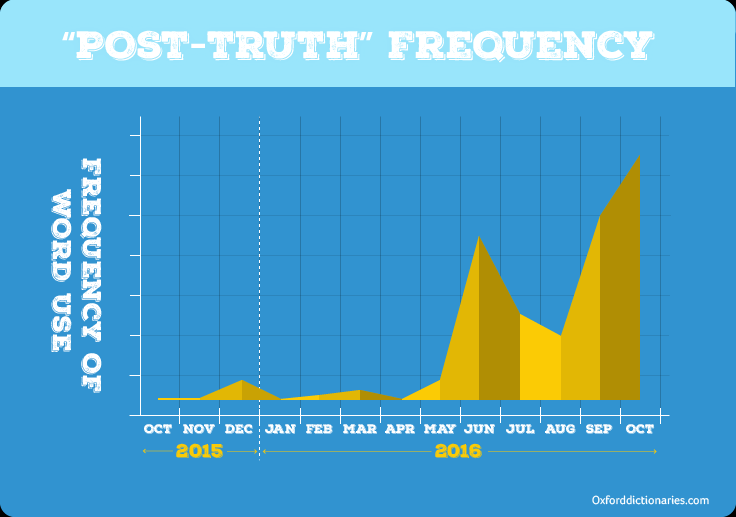 While it has been everywhere, post-truth has been most often associated with worldly ‘kings’ (including, but definitely not limited to, Donald Trump). It’s amazing (and concerning) how swiftly post-truth has risen into common usage, fuelled by politicians who should be taken to task by the public for their lies, but somehow haven’t been. All this talk about post-truth got me thinking about what the Bible says about the truth. Doesn’t that last line from Pilate sum up nicely what’s been happening in 2016?! Truth isn’t something that you get out of a test tube, or a mathematical formula. We don’t have truth in our pockets. Philosophers and judges don’t own it. It is a gift, a strange quality that, like Jesus’ kingdom in fact, comes from elsewhere but is meant to take up residence in this world. Jesus has come to give evidence about this truth. He is himself the truth… Truth is what Jesus is; and Jesus is dying for Barabbas, and for Israel, and for the world. And for you and me. Jesus is the truth, and the way in which he bears witness to this truth, the way in which he enacts his kingdom, is accomplished by him dying on the cross – the innocent dying in place of the guilty. And, in the broader Johannine perspective, we discover that the only word to do justice to this kingdom-and-cross combination is agape, ‘love’. So, real truth is fuelled by agape, the highest form of love; selfless and unconditional; the love of God for man. Real truth is what Jesus brings. In the confusing world of post-truth ‘kings’, let’s instead focus on our king, the truth, Jesus. 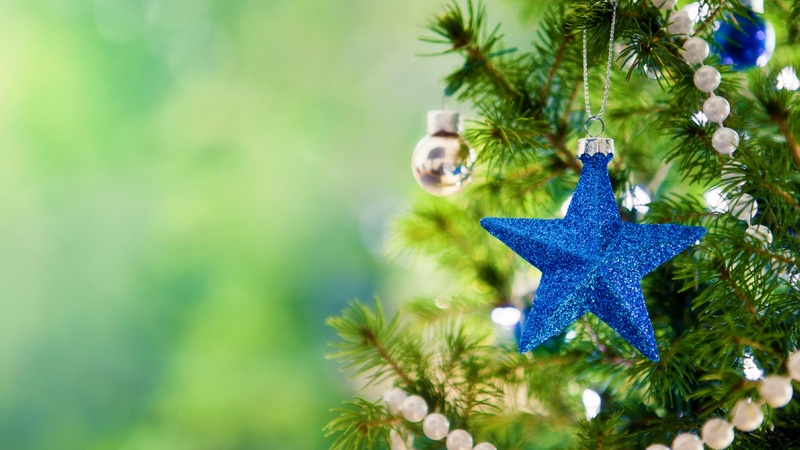 One of our family traditions during the Advent season is to visit a local church (St John’s Golden Church) which has a ‘Festival of Christmas Trees’, with trees decorated by both people in the church and various community organisations. The Christmas trees are all through the church auditorium, in the café, up hallways, and in other rooms. They’re everywhere! I love how young kids can be so easily amazed by things. It’s a shame most of us lose that child-like amazement as we grow up. Amazement and Christmas have always been linked. In Luke, after the angels tell the shepherds about Jesus’ birth, the shepherds hurry off to find this baby in a feeding-trough. After seeing Jesus, Luke says the shepherds told everyone and that all who heard were amazed. The reason for their amazement? Here was the fulfilment of prophecies from long ago. Here was the saviour, the Messiah, the King. God arriving in the flesh as a little baby. Jesus was here, and that was amazing! Maybe we all need a bit more child-like amazement in our lives. What better way to start than by spending some time this Christmas being amazed by Jesus. That he was born into our world to be our saviour, Messiah, and King. Thank you God for sending your son: our saviour, our King. May we be constantly amazed by this love that you have shown the world. At a recent work team building day (which I missed, unfortunately) we had a guest speaker, Dr Paul McDonald, who talked about his research into sustainability and neuroscience. Paul is a lecturer at Victoria University and is due to publish a journal paper on this topic next year. In layman’s language, he’s basically saying that the typical way that we communicate sustainability and the need to be sustainable doesn’t work. Often it depends on the use of scare tactics to push people to more sustainable measures – in practice, he says, this just triggers a flight response and people tune out. Also of issue is that we humans are an inherently stubborn bunch and not quick to accept change (often people know something to be true, but they don’t truly believe it to be true; there’s no emotional connection to the issue, so there’s no change). He emphasises the need for a better way to communicate sustainability. Reframing how sustainability is communicated so that it’s in a positive manner (not focused on doom and gloom, fear and academic facts). Reading this got me thinking about how often this is also the case for the good news and how we communicate it. I can’t help but think we need to communicate the good news differently (and more fully, for that matter). Let’s be clear. The relationship each of us has with God is hugely important. It is also vital to insist that God will indeed look after his people following their deaths, all the way to his final new creation. But these are not the centre of the good news. We have placed the stress at the wrong point, like people putting the emphasis on the wrong syllable. The words may be true, but the way we say them gets in the way of that truth coming out clearly. The good news is about the living God overcoming all the powers of the world to establish his rule of justice and peace, on earth as in heaven. Not in heaven, later on. And that victory is won not by superior power of the same kind but by a different sort of power altogether… The kingdom of God, Jesus declared, runs on love. Also, just like sustainability, how often are ‘scare tactics’ used as a proxy for the good news: we’re all sinners deserving death, Jesus died in our place, if we believe in him we’ll go to heaven. What Wright has shown me is that there’s so much more to the good news than this over-simplification. We’re ignoring or missing the broader context of Jesus’ death (and, for that matter, his resurrection). In his paper Paul McDonald also notes the importance of storytelling – saying that “neurological evidence supports the power of rhetoric and storytelling”. This has to be true for how we communicate the good news also – we need to tell the good news as a compelling story. Paint the picture of why it is truly good news. When that resonates with people, they will be more willing to believe it and make real and lasting change. Of course, we’re not doing this under our own steam – we have the Holy Spirit to enable us to do this work. I had the privilege of sharing the message with my church last weekend as part of the service where the kids put on their Christmas production. As an aside, it was my first time preparing and delivering a sermon – I really enjoyed it! I took this opportunity to begin to communicate the good news differently. Using the passage about Anna the Prophetess celebrating Jesus’ birth (Luke 2:36-38) as a frame, I had a go at telling the story of the good news in its fullest sense: starting with God creating the world, through to Adam and Eve’s sin in the Garden of Eden, God’s promises to Abraham, the prophecies of a coming rescuer and king, Jesus’ birth, life, death and resurrection, and what it means to have Jesus as king. This was all condensed into a very brief sermon and would benefit from the various aspects being teased out more in future sermons, however hopefully it gave people a taster of what the good news truly is. It feels strange to have been a Christian for so long but to only now discover the good news in this way. I’m looking forward to exploring this more – further reading, study, prayer, blogging and application in my life (and hopefully those around me). After all, it is the good news, and it should be central to my faith and my life. The Distorted and Competing Gospels chapter of Wright’s Simply Good News explains this way better than I could – recommended reading! Over the past few years our family has been much more intentional about observing Advent and preparing for Christmas. We set up our Christmas tree the weekend before Advent starts, do a Jesse Tree which uses the Jesus Storybook Bible (more on that here), and, this year, Kim has wrapped up heaps of Christmas children’s books and the boys get to choose a new one each day. All of this points towards Son #1 starting to anticipate Christmas more and more. Last week we were talking about how Christmas was like Jesus’ birthday, and Son #1 declared that we should make Jesus a birthday cake. I asked him how he thought we should decorate the cake? His answer – with rescue vehicles! Now, I suspect this is heavily inspired by his birthday cake earlier this year (the picture up the top of this post), which was also adorned with a full set of rescue vehicles (police car, fire truck, ambulance), however isn’t it a surprisingly apt answer?! As, after all, Christmas is celebrating the birth of our rescuer, Jesus. Perhaps the only thing Son #1 was missing as a cake decoration was a crown, or a throne – something that illustrates that not only was Christmas the birth of our rescuer, but also the birth of our King.